Although sushi is simple and delicious, it sometimes requires ingredients that can be a little on the expensive side. Luckily, there are alternative, less expensive ingredients that can be used to make sushi that is equally delicious! Of course, buying in bulk is also a great way to save money on sushi ingredients. Japanese sushi rice is generally sold in bulk quantities, so this can help you save as well. Once you make the rice, you can even freeze it in a plastic bag to save to use another time; it will stay fresh in the freezer. This will also help you save time later on if you are in a rush to cook! Sushi rice is usually inexpensive when bought in bulk; however, quinoa can also be used as a substitute ingredient if you can find some that’s less expensive at a local grocery! It is a little harder to roll because it does not have quite the same sticky texture as sushi rice, but with a little extra care, it certainly can be done! Somewhat like the Japanese immigrants did when they substituted avocado for salmon, we’ll be substituting sweet potato for any seafood. This ingredient has a somewhat similar texture, but sweet potatoes cost a lot less than fish, which certainly helps on a student budget. In addition to sweet potato, this recipe will use shiitake mushrooms. Most of the time, when this sushi is made it is seasoned with scallions; however, finely cut, cooked onions can be used as well. The sweet potato should also be cooked, then cut into thin strips. Take a sheet of seaweed, then fold and tear off a two-inch strip. Spread a layer of rice (or quinoa) over the large sheet of seaweed, but remember to leave a border on the top and bottom edges. Fold the bottom edge of seaweed up over the rice layer, and lay the seaweed strip down. Line the sweet potato, shiitake mushrooms, and sliced onions on the seaweed, and bring the whole layer down to the edge of the bamboo mat. 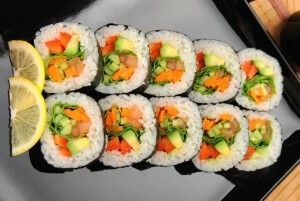 Roll the sushi together, cut into eighths, and enjoy! This is the ninth chapter from an e-book by one of the Campus Clipper’s former publishing interns, who wrote about how to make sushi. Follow our blog for more chapters from this e-book. We have the most talented interns ever and we’re so proud of them! For over 20 years, the Campus Clipper has been offering awesome student discounts in NYC, from the East Side to Greenwich Village. Along with inspiration, the company offers students a special coupon booklet and the Official Student Guide, which encourage them to discover new places in the city and save money on food, clothing and services. 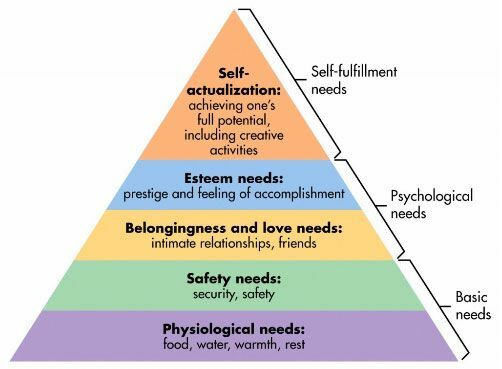 In the 1940’s Psychologist Abraham Maslow proposed the idea that human beings all have certain needs and that those needs are best arranged in a hierarchy. In time, this hierarchy was indeed coined Maslow’s Hierarchy of Needs. The five-tier pyramid shows Maslow’s interpretation of our needs. The bottom four levels are our deficiency needs, all of which must be met before one can reach the top level of the pyramid, known as our growth need. As the pyramid shows, our deficiency needs are then broken into basic and psychological needs. One must start at the bottom and satisfy their physiological needs before they are able to move up and satisfy their safety needs. and so on. Once one is able to reach the top, he or she is able to finally begin trying to satisfy his or her self-fulfillment need. If successful, this will allow the person to reach a state of self-actualization. 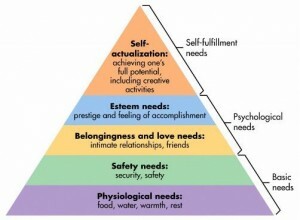 When someone reaches self-actualization, according to Maslow, they have reached their greatest human potential. It is said that only one of every one hundred people will reach self-actualization. This is because self-actualization requires some uncommon qualities, such as true honesty, awareness, objectiveness, originality, and more. Another reason self-actualization is so difficult to achieve is that many people are often too focused on satisfying their tangible deficiency needs that once they meet their esteem needs, they often then move back down and fluctuate between different levels of the hierarchy. Though we all have the potential and desire to reach self-actualization, for most people the challenges of life become too distracting, causing them to move back and forth between the different deficiency needs. Self-love is appreciation for oneself that in part grows from actions that support our psychological growth. Hence, fulfilling Maslow’s growth need – achieving a state of self-actualization – will simultaneously increase your sense of self-love. People who have a strong sense of self-love are mindful and aware of who they are, not who others say they are. These individuals also act on what they need, not just on what they want. When you love yourself, you are able to focus on fulfilling your needs even if what you need isn’t exactly what you want. Also, someone who is able to reach self-actualization is fulfilling their full potential and purpose. When one can live with purpose and intention, they will naturally also love themselves more. Personally, though I have always had the dream and desire to make a difference, I have more recently decided to make it a point to live with true purpose and intention. Consciously living each day with purpose will allow me to feel positive about what I am doing in life and will aid in my ability to reach self-actualization. I strive to be one of the people who is able to reach this state within my lifetime. I spoke with FIT student Ashley Guillois, who didn’t realize how Maslow’s Hierarchy of Needs relates to self-love. I started to explain all that you are reading now to Ashley, and now she also feels that, moving forward, it is important to aim for self-actualization. After speaking with me, Ashley feels committed to not only loving herself, but doing so by making it a goal to fulfill her deficiency and growth needs by following the tiers of Maslow’s Hierarchy. Ashley is not only a fellow FIT student, she is also my friend, who has agreed to accompany me in a few weeks when we use our Campus Clipper booklets to get self-love pedicures! I continue to encourage you to feed your self-love by fulfilling your needs (see above) and taking advantage of your Campus Clipper student discounts! Maybe this week try to begin to fulfill you most basic physiological needs with some healthy food! 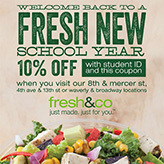 Check out these healthy student offers and begin your journey to achieving self-actualization and true self-love! 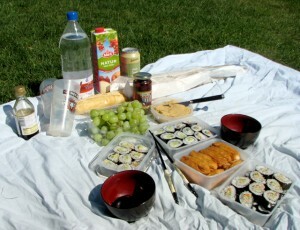 When most people think of a picnic lunch, the first thing on their minds is not sushi. However, there are a lot of summer vegetables that make for delicious sushi ingredients, and since sushi is generally a small but filling meal, it’s easy to carry with you. This recipe will use ingredients that won’t spoil and are summery and delicious. If you’re still doubtful that your sushi will be fresh, though, you can always pack an icepack along with your sushi lunch! For this recipe, we’ll be using green beans, zucchini, and dried shiitake mushrooms. There are plenty of other mushrooms that are delicious in the summertime, though, so feel free to substitute another type if you want a fresher sushi. Green beans and zucchini are great in the summer, and especially if you grow your own––green beans are super easy to take care of! These ingredients make a great and light summer meal that’s also filling. As always, fold and tear a two inch strip off the seaweed. 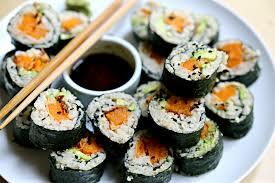 Spread a thinner layer of rice than usual over the seaweed, while leaving a border on both the top and bottom edges. This will make it a lighter meal; few people want a heavy meal in their stomachs during a hot summer! Cut your ingredients into strips—the zucchini in particular should be cooked first; the green beans can be left raw for an added crunch. Fold the bottom edge of seaweed on top of the rice layer, lay the seaweed strip down, then line up your ingredients along the piece of seaweed. Bring the whole layer down to the edge of the bamboo mat, and roll the sushi together. Cut into eighths, and pack in a lunchbox. For a nice snack, cherry tomatoes and snap peas will go along well with your healthy picnic lunch! This is the eighth chapter from an e-book by one of the Campus Clipper’s former publishing interns, who wrote about how to make sushi. Follow our blog for more chapters from this e-book. We have the most talented interns ever and we’re so proud of them! 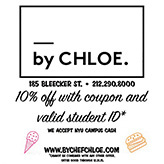 For over 20 years, the Campus Clipper has been offering awesome student discounts in NYC, from the East Side to Greenwich Village. Along with inspiration, the company offers students a special coupon booklet and the Official Student Guide, which encourage them to discover new places in the city and save money on food, clothing and services. Generally, when I’ve been stuck in the library for a while, and I finally take a study break, it’s spent watching stupid youtube videos while eating junk food from the vending machine. Although that makes for an easy snack break, junk food is not such a great idea. After all, there are plenty of foods that are good for your mind and memory, and there’s no better time for a stimulating snack than on a study break! Several of these “brain foods” make for a great sushi recipe, so the next time you need a snack while you’re studying, try it out! For this recipe we’ll be using brown rice and sushi rice mixed together, along with broccoli, eggplant, and asparagus. Brown rice provides vitamin B6, which has been linked to memory, cognition and brain health. Broccoli, too, has B6, as well as vitamin K, which is known to improve the health of brain cells. Eggplant contains nasunin, an antioxidant that is said to protect the lipids in brain cell membranes that maintain your brain’s health; and asparagus is a good source of folate, which is good for your brain and even reduces the risk of dementia later in life. To start, fold and tear a two inch strip off the seaweed. 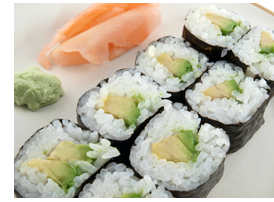 Spread a layer of rice over the seaweed, while leaving a border on both the top and bottom edges. Fold the bottom edge of seaweed on top of the rice layer, lay the seaweed strip down, and line your ingredients up. Bring the whole layer down to the edge of the bamboo mat, and roll the sushi together. Cut into eighths, and enjoy! For a drink that goes well with your study sushi, rather than having a soda, try some matcha green tea on the side! It’s delicious, and it has antioxidants and vitamins that are also good for your brain! This is the seventh chapter from an e-book by one of the Campus Clipper’s former publishing interns, who wrote about how to make sushi. Follow our blog for more chapters from this e-book. We have the most talented interns ever and we’re so proud of them! For over 20 years, the Campus Clipper has been offering awesome student discounts in NYC, from the East Side to Greenwich Village. Along with inspiration, the company offers students a special coupon booklet and the Official Student Guide, which encourage them to discover new places in the city and save money on food, clothing and services. 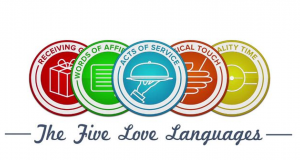 The five love languages, as created by Dr. Gary Chapman, describe the different ways that people give and respond to emotional love. Of course, the idea behind understanding the different love languages is to create a lasting and truly happy marriage. However, this can also be tied strongly to all of our relationships, as well as the one we have with ourselves. The first of the love languages is Words of Affirmation. This language includes using verbal compliments and terms of gratitude as ways to communicate our love. Using words of affirmation is a great way to show our appreciation for those we care about. 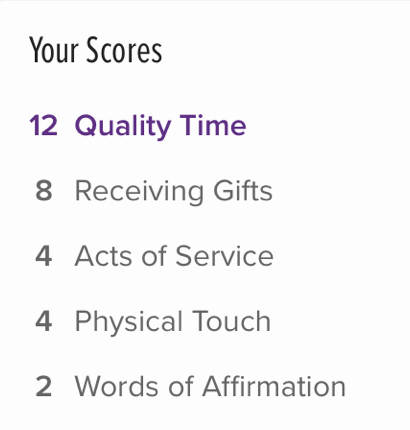 Quality Time is the next love language. It is important to take time for each other, to bond and appreciate each other’s company. When it comes to self love, it is just as important to take time for yourself and treat yourself with kindness and care, and to truly understand how you are feeling.The importance here, especially in today’s generation, is to not spend this time watching TV or browsing Facebook. Instead, partake in an activity that allows you to think and reflect on your feelings, thought processes, goals, aspirations, etc. Next is Gifting. This is the idea of using some sort of gift, whether it costs money or not, to show someone that you have been thinking of them. Someone who primarily speaks this love language will use and appreciate gift giving as an expression of love. The Acts of Service love language goes hand in hand with the saying “actions speak louder than words.” If someone’s primary love language is Acts of Service they will appreciate someone cooking them dinner, helping them with work that has been stressing them out, cleaning for them, or running errands for them. The last love language is Physical Touch. The people that predominantly speak this language are those who we may recognize as “touchy feely”. Without physical touch these people don’t feel the same connection, compassion, or overall love. 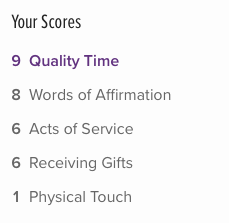 In a relationship, quality time is the most important for me. This means I appreciate someone’s undivided attention and spending uninterrupted time with another to deepen the connection between us. Now, when it comes to self love, this means I appreciate spending time alone doing activities that I enjoy and that help me feel happy and refreshed. So, how can I feed my most prominent love language, thereby improving my sense of self-love and save money while doing it? Campus Clipper, of course! In the coming weeks I plan to use my Campus Clipper coupon booklet to get a student discount on a pedicure. Getting a pedicure will be a great way for me to focus on myself, clear my mind, relax, and will leave me feeling refreshed! Jordan and I share the primary love language of Quality Time, and while I was speaking with her, she told me that she also loves to get her nails done in order to give herself some love. Getting her nails done and visiting Newport Mall for shopping on a regular basis are important to Jordan, allowing her to rejuvenate and ensure that she is giving herself the love she deserves. 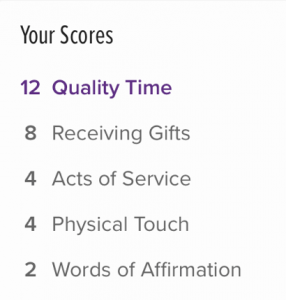 I believe that it is important for those of us with a primary love language of Quality Time to frequently take time to ourselves to simply do what we enjoy most in order to really feel great, and Jordan agreed with me on this. I suggest you also take Chapman’s test to learn your primary love languages. This will help you understand how you need to be cared for in your relationships with others and how you can truly care for yourself. Sushi is one of the easiest meals to adapt for vegetarian eaters, mainly because when you make it yourself, all ingredient choices are up to you, and sushi is tremendously variable with regard to ingredients. This recipe includes egg—if you’re vegan simply leave it out—as well as dried shiitake mushrooms and spinach leaves. For vegetarians and vegans who need to watch their protein intake (since animal products are an important source of protein), this recipe makes sure to use ingredients that have plenty of protein. Nori seaweed, shiitake mushrooms, and brown rice are good sources of protein; the mushroom also provides dietary fiber and iron. It’s a good idea to use half brown rice and half Japanese sushi rice, so that the rice stays sticky enough to roll easily. The egg in this sushi is cooked like an omelet, but sweetened. Take an egg and beat it in a bowl––beating the egg thoroughly will help make sure the color is even. Add a pinch of salt and about ¼ teaspoon of sugar, and cook it in a pan, making sure to keep it as flat as possible. When it’s cooked, fold it and cut into strips. Cut the dried shiitake mushrooms into strips as well. Once all your ingredients are prepared, fold and tear a two-inch strip off the sheet of seaweed. Now cover the seaweed with rice, leaving a border of about an inch on top and a half inch below. Fold the bottom border on top of the rice, and lay the seaweed strip on top of the rice. Line up your ingredients on the seaweed, and bring the whole layer to the edge of your bamboo mat. Hold the bamboo mat and seaweed with your thumb and forefinger, and, keeping the ingredients in place with the rest of your fingers, fold the seaweed and bamboo mat over the ingredients. Unroll the bamboo mat, bring the seaweed to the edge of the mat once more, and roll the sushi all together. Now simply cut the sushi into pieces about an inch long. A great side dish to go with this sushi is miso soup with tofu. Tofu is a great source of protein, so this soup is the perfect side for anyone worried about protein intake! This is the sixth chapter from an e-book by one of the Campus Clipper’s former publishing interns, who wrote about how to make sushi. Follow our blog for more chapters from this e-book. We have the most talented interns ever and we’re so proud of them! For over 20 years, the Campus Clipper has been offering awesome student discounts in NYC, from the East Side to Greenwich Village. Along with inspiration, the company offers students a special coupon booklet and the Official Student Guide, which encourage them to discover new places in the city and save money on food, clothing and services.